Who doesn’t love blowing bubbles and then experiencing the pure visceral joy that comes from popping them? 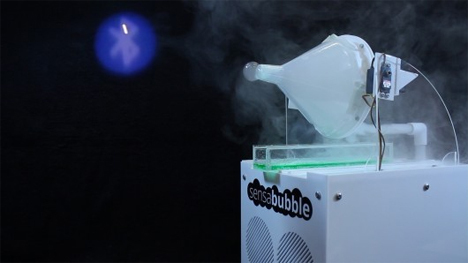 That is the idea behind SensaBubble, a multi-sensory mid-air display that combines sight, smell, and the satisfaction of popping bubbles. 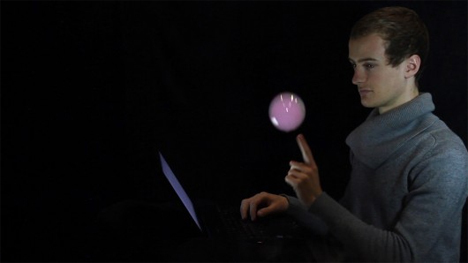 Designed by Professor Sriram Subramanian of Bristol University, the SensaBubble could be used for marketing, education, gaming, or a number of other applications. The way the machine works is best described by the video above. Bubbles’ trajectories can be guided by the machine, then tracked so the SensaBubble system can project colors, words, or logos onto the fog-filled bubbles. An optional aroma can be added to the fog to provide another layer of sensory stimulation. We would love to see this type of system used in everyday life. Imagine how fun it would be to get an email notification in the form of a floating bubble, then pop it with your finger to send it away. For those of us who feel like we’re overloaded with information and notifications all day, every day, this could be a far more relaxing way to get and then release those notifications. See more in Digital Design or under Technology. May, 2014.